When craving comfort food, you can’t beat meltingly tender short ribs slow-cooked in a sweet and tangy barbecue sauce. When you’re craving comfort food, you can’t beat meltingly tender short ribs slow-cooked in a sweet and tangy barbecue sauce. And here’s the best part: only 15 minutes of prep work and the oven does the rest. Unlike many roast or stew recipes, it’s not necessary to sear the meat first. You just slather it with sauce, put it in the oven, and let deliciousness ensue. Before we get to the recipe, a few words on boneless short ribs. You’ll want to count on about one pound per person. I know it seems like a lot but they shrink significantly while cooking, and people tend to eat generous portions. I buy mine from Whole Foods. Begin by cutting the short ribs in half and seasoning them with salt and pepper. Place them in a 9″ x 13″ baking dish. Next, make the homemade BBQ sauce by combining the ketchup, dark brown sugar, cider vinegar, Worcestershire sauce, Dijon mustard and spices in a small bowl. Slather about 2/3 of the sauce all over the short ribs, and reserve the rest for the finished ribs. Cover the pan with aluminum foil and bake at 300 degrees for about 2-1/2 hours. Remove the foil, pour off some of the cooking liquid and cook for 30 minutes more, or until the short ribs are tender and browned. Transfer the short ribs to a platter, leaving the cooking liquid behind, and slather with the reserved BBQ sauce. Season the short ribs all over with salt and pepper, then arrange in a 13 by 9-inch baking dish (it will be a tight squeeze). Combine all of the ingredients for the BBQ sauce in a small bowl and stir until smooth. Pour 1/3 of the sauce (about 1/2 cup) over the short ribs. Using tongs, flip the ribs over and spoon another 1/3 of the sauce over top. Reserve the remaining BBQ sauce to spoon over the cooked ribs. Cover the pan with aluminum foil and roast for 2-1/2 hours. Remove the foil and, if the cooking liquid is covering the meat, use a large spoon or ladle to remove some of the liquid so that the tops are exposed. (Note: the meat will look unappetizing at this stage; don't worry, it will look much better once it's done!) Cook for 30 minutes more, uncovered, until the meat is tender and browned. Cut off any excess fat that remains around the short ribs. Transfer the short ribs to a serving platter. Discard the cooking liquid, as it will be very greasy. Slather the reserved BBQ sauce over the short ribs and serve. Freezer-Friendly Instructions: The ribs can be frozen for up to 3 months. Reheat them tightly covered with foil in a 300°F oven until heated through. Hi! I plan to double the recipe and bake in the oven at the same time. Do you have any suggestions on how on adjust the cooking time? And do I need to swap the dishes at all to ensure even baking? Hi KJ, The cook time should be about the same or just a bit longer; just keep an eye on it. And it’s always a good idea to rotate the dishes in the oven, especially if your oven heats unevenly (as most do). Hope you enjoy! Delicious! I made ribs ahead for a family that just had a baby. All they had to do was warm up ribs to reheat. They loved the short ribs & our family did too. Thanks Jenn! I prepared this recipe for my upcoming Seder and froze the meat, reserving the remaining sauce. Should I reheat the meat dry and then slather with the sauce or pour the sauce on before reheating? Hi Sherrie, I’d reheat them in the sauce. (Make sure to tightly cover the dish with foil). Hope you enjoy! I made the Easy Slow-Baked BBQ Short Ribs for dinner with a small change, and it was a HUGE hit with my picky crowd!! I realized I did not have all of the ingredients on hand to make the bbq sauce so I had to substitute store bought bbq sauce. Cooked it according to the directions, came out perfectly!! Thanks so much!!! I had never made ribs before and these were a real delight. We will definitely be making them again! Deliciously tender, tasty meat and SO easy to make! Timings in recipe are perfect. I will definately make this simple “wow” dish to delight family and guests again. Paired with your cornbread and red cabbage/carrot slaw. I cooked the ribs this morning, hoping to reheat them for our party tomorrow night. But when I tested a piece before storing in the fridge, I realized the meat is pretty tough and dry. Did I overcook? How can I save this? There’s not much liquid left in the cooking tray at this point. Should I add some liquid when I reheat tomorrow? Beef broth? Any rescue suggestions will be greatly appreciated. Thank you! Hi Akiko, If it’s tough, that most likely means it’s not cooked enough. As long as you used the right cut of meat, it should eventually get tender (you really can’t overcook these). I’d add a little water to the pan, cover it tightly, and continue cooking until the meat is fork tender. These are super easy and tasted great. Would not change a thing. Can these be made in a glass pyrex dish instead of ceramic? If not, I also have an All Clad roasting pan or a Le Creuset round dutch oven. What do you recommend? Hi Talia, A glass pyrex will be just fine here. Hope you enjoy! Our family loves this recipe!! For left overs, we shred the beef and make sandwiches. Other than the sauce that goes with it, could you recommend any sauce/condiments that would go well with this? My daughter thinks it’s quite sweet even though I’ve reduced the amount of brown sugar. Hi Beatrice, Glad you like this! I the sandwiches would be nice with grainy mustard or spicy pickle slices. Those would help to temper the sweetness a bit too. Can you use terrific sauce in place of barbecue sauce? Hi Chris, I’ve never heard of terrific sauce – can you describe what it is? I made this recipe for the first time last night and the meat came out tough. All your recipes thus far have been a hit and clearly from the reviews this one is popular as well so I’m guessing I went wrong somewhere. I don’t ever cook beef short ribs so I am not sure how the meat is supposed come out but I doubt its supposed to be tough. Any ideas what I did wrong? Are the ribs supposed to be complete submerged in the sauce? Hi, there—LOVE this recipe!!!! But, want to know: could you use bone-in short ribs? Sometimes, that’s all my market has. If so, what adjustments would I need to make, if any? Thanks so much and Happy Thanksgiving! Glad you like these! It’s fine for you to use bone-in short ribs and the cooking time should be about the same. Hi, I love your recipes! Can I prepare this the night before, refrigerate and bake the next night? Making soon, let me know. I was able to impress my in-laws with this recipe. It was loved by all. These short ribs were amazing! I made them when my young adult children were all home and they gobbled them up. As good as any short ribs I’ve ever had in a restaurant. The BBQ sauce would also be great on shredded beef or pork. Will be a new family favorite! Would it be the same cooking time for half the amount? 2 lbs? Hi Michael, I would strongly encourage you to make more than 2 pounds because these shrink A LOT! But if you do use less than 4 pounds, the cooking time may be a bit (but not significantly) shorter. Just be sure to use a dish that just fits the ribs and sauce as you don’t want too much extra space in the pan. Hope you enjoy! I’m not a great cook lol so this may seem like a silly question. I only bought a small package – 1 1/2 pounds because there is only 2 of us. How much would I reduce the cooking time or do I at all? Thanks so much!! Sounds yummy and can’t wait to try it!! Not a silly question, Stormy! Although there are only two of you, I would strongly encourage you to make more than 1.5 pounds because these shrink a ton! But if you do use less than 4 pounds, the cooking time may be a bit (but not significantly) shorter. Just be sure to use a dish that just fits the ribs and sauce as you don’t want too much extra space in the pan. Hope you enjoy! The ribs I have are called boneless country style beef ribs. Will they work as well. That should be fine, Marlene. Enjoy! Hi Rae, So glad you’re enjoying the cookbook! It’s fine for you to use bone-in short ribs and the cooking time should be about the same. Hope everyone enjoys! Made it this weekend, delicious and to have again soon. These have become my go to recipe Sunday recipe. It’s easy, doesn’t require a lot of ingredients and they always turn out tender and delicious. Because my family typically likes a more spicy/tangy bbq sauce, I typically add a little pepper sauce and use a half cup of brown sugar rather than 3/4 cup. Do not skip cutting the short ribs in half, they cook so much faster. I HEARTILY recommend. This may be a stupid question, but can I use this sauce on pork ribs? Would I still follow your pork rib recipe the same way if I use this sauce? Thanks! Not a stupid question! Yes, I think you could use this sauce on the pork ribs with no modifications necessary. I’d love to hear how they turn out! Hello! I am planning to make this today. Why do you cut the meat before cooking? More surface area for the sauce? Just wondering what the results will be if I skip that step. Hi Amy, Yes that’s correct. It’s fine to skip that step but it may take a bit longer to cook. Hope you enjoy it! I think the sauce would be great on chicken as well….thanks so much! I made these (they are delicious!) in advance and froze them. Can you please advise the best way to reheat after defrosting? My concern is that putting them in the 300 degree oven (covered) for 30 min. could really dry them out. Should I cover with sauce to prevent that from occurring, but make extra to pass when serving? Thank you! Because they are covered while reheating and will be frozen in the sauce that they originally baked in, they really shouldn’t dry out. If it makes you feel more comfortable, you can make a little extra sauce and drizzle it over the ribs before reheating (and still have plenty to pass when serving). Hope that helps! Hi Jenn! We made these last night. The sauce is fabulous! Our ribs (that we bought from Whole Foods ) were still quite fatty. We did bot cut them in half (missed that step)—is that why? My husband was thinking we should have cooked them longer maybe? Hi Rachel, I don’t think not cutting the ribs should’ve caused a problem. It does sound like the probably needed to cook longer as they should be really tender after coming out of the oven. Forgive me for asking another follow-up question. Can you please be very specific about the exact type/cut of boneless beef short rib you use and what I should ask my butcher for? I went to purchase them and the short ribs I saw looked nothing like what yours do in the photos. Also, are they 4″ and you cut them in half or longer and you cut to 4″? Thanks for indulging my confusion! No need to apologize, Andi! I would suggest asking your butcher to point out the right cut as I don’t really know other names that these would be referred to by. Perhaps you were looking at pork ribs the last time you were at the store? And, yes, these do get cut into 4-inch pieces once you get home. Hope that helps! Sorry, left off my rating! The BEST BBQ Short ribs and so easy to make. I like to serve shredded in flour tortillas and top with honey mustard cole slaw. In a pinch I have used jar bbq sauce and they are still yum! You are my absolute favorite blog chef! I forward your yummy recipes all the time and can’t wait for the cookbook- which I’ve already ordered. I am thinking about serving this for our seder this year (I’m so tired of brisket!). Would you recommend it and, if so, should I still count on 1lb./pp since there is so much other ritualistic food at this holiday? Hi Andi, Omg how is it already time to start thinking about Passover?! I think this recipe would be delicious and a welcome change from brisket. I’d definitely still count on 1lb per person — this tends to be a crowd pleaser and you don’t want people to feel like they have to ration their portions. Plus, it freezes well if you have leftovers. Hope that helps! I think it would work nicely. LMK how they turn out! Instant pot time! I have been making this recipe for years and it is a family favorite. Last night I finally tried it in the instant pot and it’s even better. I put the boneless short ribs in the pot, coated with pepper and the bbq sauce. Cooked on manual for 40 minutes, natural pressure release. Served with extra sauce. That’s it, and they are even better than in the oven. No need to brown. Seriously! I would love to try in the instant pot. Did you put them on the trivet? How many lbs did you use? Still cut them in half? How long approximate does it take to natural pressure release? Do you just let the 40 minutes run out and then leave it? I’ve never done natural pressure release. Sorry for all the questions, but want to make sure I do it right. Yep! I’d love to know how it turns out. They were amazing. I cooked them on low for 8 hours. I had just over 5 pounds so I poured most of the sauce over them. Served them with mashed potatoes and herbed Frenched green beans. My husband said they were better than any he’s ever had at a restaurant. A keeper for sure!! Hi, here’s my review, my name is Danielle from Montreal Canada, bought short ribs from costco and did not know how to cook; so I looked on Pinterst and found your recipe. Did them in the oven and burned them to a crisp ( my oven malfunctionned and I have to have it fixed) so never got to taste them had to trow them in garbage. So bought more and made them in slow cooker, since my oven is still not functionning; oh my god they were so good……. cooked them on high for 2 hours and low for another 2. I didn’t take out the fat that them made when cooked. My husband is very finiky eater, he almost ate the whole plate of ribs, and definatly a REDO. Thank you for perfect and simple recipe. I have made this before and it was a hit! Thank you! I need to make it a day before my dinner party, will it be as good? Definitely, Laurie – it will be even better! Thank you. I forgot to ask what would be the best way to reheat before serving? Hi Laurie, I’d reheat in the oven, tightly covered with foil, at 300°F. I’d start checking them at about 30 minutes. This was a hit in our home. I had never made beef ribs before. My husband is a fan of pork and I do not do pork. The beef ribs were a bit harder to find, but this recipe is great. I followed it to a “tee”. It takes sometime, but very good and very worth making. I would totally recommend these. We are having them for game day!! Made this for a dinner party and was very, very pleased. Tasty and delicious. My guests enjoyed them and my husband commented what a festive dish it was. Directions were spot-on. Many thanks Jennifer! Can you make this with bone in beef short ribs? Would it change the recipe or cooking time at all? We are in Japan and I haven’t been able to find boneless short ribs. Yes, Kelli, you can use bone-in ribs and the cooking time should be about the same. Enjoy! This sounds so delicious! Ive made a recipe similar to this but the sauce in this one makes so much more sense and sounds like the perfect blend. In the past I’ve always seared the meat coated in flour first and i see you didn’t find to be necessary. My question is how it would change the end result by searing or not searing? I have a great deal of respect for your opinion and have loved all your recipes. Thanks! Hi Michelle, based on the way these cook, searing them is really not necessary. That said, if you do choose to sear them, it would add a little more depth to the flavor as well as a bit of a crust on the outside of the ribs. Hope that helps! Hi Lawrence, I think boneless pork ribs will work with no modifications. I’d love to hear how they turn out! Being pressed for time I decided to try this recipe in my Instantpot. I Pammed the pot and browned the ribs on Saute. I followed the recipe for the BBQ sauce exactly except I reduced the sugar to 1/2 cup. I poured 1 cup sauce over the browned ribs and pressure cooked them for 35 minutes, letting the pressure release naturally (took about 15 minutes). THESE RIBS WERE FABULOUS!!! Thank you Jenn! So glad to know that these worked nicely in the Instantpot. Thanks for letting other readers know! I have two large boneless ribs totaling 1 pound. I will use a smaller pan and less sauce, but does this change the baking time? Hi Melissa, I would strongly encourage you to make more than 1 pound because these shrink a ton! But if you do use less than 4 pounds, the cooking time may be a bit (but not significantly) shorter. Just be sure to use a dish that just fits the ribs and sauce as you don’t want too much extra space in the pan. This looks amazing!! Wondering could I use minced garlic instead of garlic powder?? Sure, Nicole, that should work. Hope you enjoy! Jenn, I am about to make this, with bones. Do you think Dutch oven would work with this? Many thanks! Sure, Janet – that should be fine. Enjoy! If using bone-in short ribs, will the baking time be the same? Lol I’m sorry. Hi P, Yes cook time will be about the same. Enjoy! Going to make these for NYE – is this okay to do for short ribs with bone on as well? Sure, Tiffany – that should work. Made this last night and it was delicious! Even though I think the beef I used was too lean? After the first two hours there was virtually no liquid left. But the beef was so freaking tender and delicious. It was like a very soft jerky! Yum! My entire family is obsessed with this recipe! I buy thick, fat, boneless ribs from Wegman’s and they work perfectly! They are a bit pricey but my goodness they are worth every penny to make this dish. There are NEVER any leftovers. We often spice up the sauce for personal preference. Thank you for such an outstanding recipe. I can’t believe some of the 1 star reviews on here– they are not warranted by any means! Did I mention these are in the oven right now 🙂 yum! We loved this recipe!! I only had about a pound and a half of meat so I cut the sauce recipe in half. The meat really does shrink up a lot, but luckily it was only for 2 people so it was just enough. The sauce was amazing and will definitely use it again! I paired the short ribs with potato au gratin from Lidl and sweet peas. Amazing dinner! I only have 1.5 pounds of ribs. How can I alter the recipe/ cooking time? Hi Ally, I would strongly encourage you to make more than 1 pound because these shrink a lot! But if you do use less than 4 pounds, the cook time may be a bit (but not significantly) shorter. Just be sure to use a dish that just fits the ribs and sauce as you don’t want too much extra space in the pan. Amazing, amazing, amazing! Thank you! Excellent! Did not need the last 30 minutes in the oven. Less pepper and salt would be better. It can’t get any better: easy to make and finger lickin’ good. Thanks for making great cooks out of us! Hi, I have made this recipe several times and they are amazing every time. My Costco no longer carries choice cut anymore, so I had to buy the prime cut (more$$) and they appear to be somewhat thinner, because of the quality. I am a little worried if I follow the cooking time I may overcook them. I know they are forgiving. Still worried. Butcher suggested cutting the cooking time by an hour.. any suggestions? Hi Pete, That sounds about right. Instead of uncovering after 2.5 hours, I’d check at 1.75 hours. If they are pretty tender by then, you can proceed with the recipe. Hope that helps! Just made these ribs and wow! Fantastic. Will be making these again. No need for a knife. Butter soft. And little fat. The tangy sauce is perfect. Getting more ribs from Costco to make this recipe again. Thanks! What spices? Where is the recipe? This looks genius but I need a little help! Hi E, It sounds like you are just looking at the portion of the page that has the pictures with some instructions underneath. If you scroll down a bit to under the pictures, you’ll find the full recipe. Alternatively, at the very top of the page, you can click the “recipe” button right under the recipe title. sauce good , but the baking time was off. took 4 hours. You are an angel! I tried your bbq short ribs and it was a hit. My husband has been asking me to make it again. I also made your potato au gratin and did a change by I adding spinach and my family loved it. I am so happy I found your site. I will be cooking more of your recipes. Your site is my top site to go for recipes. Keep it up. Thank you so much! This is my new comfort food. So delicious! I’ve made it a number of times for guests and they all love it. Wonderful flavors and incredibly tender. Make sure the ribs aren’t too lean. My kids are really happy when we’re having this for dinner! Can this be made without the sugar? Hi Michelle, I wouldn’t recommend cutting out all the sugar, but you could cut it back a bit. Hope you enjoy! I made this for Easter Sunday exactly as the recipe is written. Although I really enjoyed the short ribs, they can be very sweet. The meat was tender. The BBQ sauce recipe is great, and I will use it again on other meat. However, I think it may overpower these short ribs OR it may just be that I’m looking for a more complex red wine type sauce that you usually get with short ribs in a restaurant. I will make the recipe again for family, but I’ll adjust the amount of sugar down. If only cooking one pound, do I adjust the cooking time? Hi Melissa, I would strongly encourage you to make more than 1 pound of these because they shrink a lot! But if you do use less than the 4 pounds, the cook time may be a little (but not significantly) shorter. Just make sure to use a dish that just fits the ribs and sauce as you don’t want too much extra space in the pan. Tastes like Manwich – don’t buy short ribs and end up with this, I was very disappointed and found it was a waste of $$$. Sorry – just being honest. Really? I found these to be INCREDIBLE! Just the right amount of spice and sweetness, and we saved that BBQ sauce to use all week. I am making these today and reheating tomorrow for a big family birthday dinner – about 10 people. Do I do the recipe all the way through including the last 30 min. browning before refrigerating? I’m planning to reheat at 300 degrees, covered with foil. Only thing I’m not sure about is how long to allow for reheating? Can’t wait to impress the family! Hi Lee, I’d cook them all the way through today. And while reheating, I’d start checking them at about 30 minutes. Hope everyone enjoys! Thanks for this! I’m making them ahead for our Passover seder next Monday, and will need to reheat. Hi how long should I cook two pounds? Hi Lynn, I would encourage you to make more than 2 pounds of these because they shrink a lot! But if you do use less than the 4 pounds, the cook time may be a little (but not significantly) shorter. Just make sure you use a dish that just fits the ribs/sauce as you don’t want too much extra space in the pan. Hi Joe, While I think the flavor would be good with teriyaki sauce, I’m not certain it would be thick enough. This recipe looks great~ I was wondering if the nutrition info is for the whole recipe or 1320 calorie per serving? This was such an easy recipe and my husband loved them!!! I make them weekly now! Loved it! What’s the best way to reheat the short ribs? Hi Dawn, I’d reheat in the oven, tightly covered with foil, at 300°F. Absolutely phenomenal! And so easy!! I used bone-in short ribs because I think it adds a bit more flavor. But that was the only thing I changed. This is a keeper!! Hi Jamie, I think this recipe is best made in the oven because you need to be able to brown the meat at the end, otherwise it will look very unappealing. You could make the ribs up to that point in the slow cooker, then transfer them to the oven to brown, but that seems to be more trouble than it’s worth. I went to Whole Foods and got a little over 5 lbs of short ribs. The butcher cut them into 14 pieces ( approx 3″ long by 2″ wide). They look smaller than yours in your recipe pic. Would you cook these the same amount of time as your recipe given their size? Hi Marny, as their size isn’t that different from the ones I use, I think the cooking time should be about the same. Hope you enjoy! Can you use pork ribs? Hi Tamara, Yes, pork ribs will work. Awesome recipe. Quick, easy, and delicious. Is it okay to use bone in short ribs? Sure Michele, bone-in will work fine. Hello! I want to make these a day ahead. I plan to drain the cooking liquid off and cover with BBQ sauce as I read in another question/answer. My question is – do you think they would reheat nicely in a crockpot instead of the oven? Or do you feel like they really need an extra sizzle from the oven heat when rewarming? I’m taking this to a friend’s house for Christmas, and I know we need the oven for other things we are making. Thanks so much! Looks fabulous! Hi Lorraine, I do think they need that extra time in the oven to brown — it adds flavor and also makes them look much more appetizing. But I think you could make them entirely ahead and then just reheat them in the crockpot. They are pretty hard to overcook :). Hi, I’m making these boneless short ribs the day before so should I leave them in their cooking liquid overnight and reheat in the liquid or transfer to clean plate and refrigerate overnight then reheat using remaining bbq sauce? I’ll rate after trying it tomorrow. Hi Michelle, you can leave them in sauce. They should be delicious the second day! The short rib recipe sounds wonderful and I plan to make it for friends on Sunday. The instructions say to cut the ribs in half, but I’m not exactly sure what that means – make them thinner? Will review the recipe after I have made it. Hi Peggy, I cut them in half so that they’re not as long (not thinner). Hope that clarifies! Thanks, Jenn. Made the short ribs for guests on Sunday and, when I offered the leftovers to my husband on Monday, he said “they’re so good, we can have them every night.” And that’s from someone who rarely eats beef. Everyone loved them and they truly are “easy.” Served them with maple-glazed roasted butternut squash and Parmesan roasted cauliflower, so everything was done in the oven – thanks again for great recipes. These short ribs come out delicious! I am mouth watering just thinking about them. They are so tender and YUMMY!!! I accidentally bought light brown sugar. It’s in the oven now so I never tasted it yet. What difference will it make? It will be perfectly fine, Felicia. No worries! This is the second time that I have used this recipe and it was just as good as the first time even though I had bone in short ribs this time. I didn’t change a thing and they came out tasty and tender. The bones literally fell away from the meat while they were cooking. Thanks again for your foolproof recipes Jennifer! Wow! Such a great change of pace! I got the ribs from Whole Foods, on sale! Three hours did the trick for tenderness….I then put the ribs in a clean pan, and once they were room temp, refrigerated them. An hour before serving, I will pop them in the oven while I roast the carrots, and cook and mash the potatoes…done and done!!! I snuck a taste, and the sauce is soo worth making…try this one, its worth the calories!!! I’ve made this dish 3 times already. It’s such a great make ahead dish and heats up easily in the oven especially when you’re having guests over and don’t want to fuss with the meal preparation and cleanup. My guests have commented on how good and flavorful it is. It’s a pretty forgiving dish so you can actually play with the flavors quite a bit. My tips for this dish are 1) If you’d like to save some time, buy your favorite bbq sauce instead of making it, I like a little asian flavor in it so I used bbq korean sauce with it or some hoisin bbq sauce 2) It’s a really nice dish to make ahead because the flavor gets better after a day or so 3) Try buying a nice cut of boneless short ribs, I bought mine at a few places but found that the one at Costco was best, either way they were all still perfectly delicious. Will this recipe apply to country style pork ribs, as well? Thank you. Hi Nancy, Yes, pork country style ribs should work fine here. Cooking time will be about the same, but taste to be sure they are getting tender after 2 1/2 hours before you remove the cover. If not, cook another 30 minutes and check them again. We have a Thermador professional 6 burner stove. Would I need to reduce the temp. so they won’t dry out? Hi Deb, Maybe I’m misunderstanding your question, but these are baked in the oven (as opposed to being cooked on the stove). If I want to do just a pound of these what should I cut the cooking time back to? Hi David, I would encourage you to make more than one pound of these as they shrink A LOT! That said, if you’re using less than the 4 pounds, the cook time may be a little (but not significantly) shorter. Just make sure to use a dish that just fits the ribs/sauce as you don’t want too much extra space in the pan. Is this recipe really 1300 calories per serving? It is– It’s delicious but a definite indulgence!! Oh my gosh! This recipe is SO delicious – and easy! I made it the first time exactly as per the recipe and it was amazing. The second time I made it, we were camping. My little RV oven doesn’t heat consistently – or well – so I brought my slow cooker and slow cooked it during the day, with the 1/2 hr top off in the oven at the end. It came out just as good as the first time. This will definitely be put in our “go- to” book! I’ll start by saying i love your recipies and on the whole have great luck so for that, THANK YOU! Regarding these ribs however…I checked my ribs at the 2 hour mark. The meat was clearly done and very tough. Any ideas why? Maybe to lean? I am following the recipe so they are back in the over to brown which i dont think will help. Whether the butcher didnt know what a short rib was or the meat just wasnt good, this meal will be an expensive mistake. I will say the sauce is great and one i will make again. Hi Jennifer, Even though they look done much sooner, short ribs really do need to cook for the full 3 hours to get tender. Hope they turned out well in the end! This was way, way too sweet! Tasted liked candied bacon. Is it ok to season and add the barbecue sauce in the morning, refrigerate and then put in the oven later that day? I won’t be home and would like my husband to get the ribs started since they take 3 hours to cook. Thanks! Sure Laura, that would be fine. If there’s time, I would have your husband take it out of the fridge about 45 minutes before putting it into the oven. What temp/how long would be the equivalent for a crock pot? Thanks! Hi Laura, I think this recipe is best made in the oven because you need to be able to brown the meat at the end, otherwise it will look very unappealing. You could make the ribs up to that point in the slow cooker, then transfer them to the oven to brown, but that seems to be more trouble than it’s worth. Not when its 95 out and I don’t want the oven on for 2-3 hours! :o) Thanks for the idea, using the crockpot and oven as a last step is exactly what I’m going to do. use the snake method using charcoal to achieve a 300ºF temp, place your foiled disposable pan with the beef inside indirect (not over the coals or gas flames) and proceed as described above. Perhaps to sear them in olive oil and a little butter on all sides first and then transfer them to the slow cooker would be successful. You would need to cook them longer in the slow cooker. I am going to try this method myself. This recipe is so easy and the ribs are filled with mouth-watering goodness- Fantastic ! Both times I used bone-in short ribs and they were delicious. I even froze some of the left overs ( cooking for one) and they were also perfect after freezing and thawing them !! They would be delicious with polenta or mashed potatoes but I served them with buttered noodles tossed with dill. Yummy ! Thank you , Jenn. never cooked short ribs before so I was looking for a recipe and saw this. Your pictures make the ribs appear rather thick and mine are more like 3/4″ thick or less. should I reduce the cooking time? Hi Linda, Yes, you may want to reduce the cooking time just a bit. I’d start checking them after about 2 hours. Just finished eating these ribs. This is an awesome recipe. The ribs were cooked perfectly and the barbecue sauce was better than anticipated store bought. This was delicious and super easy to make! Loved by my family, adults and kids alike. The BBQ sauce is now my go-to…forget store-bought. I’ve shared the recipe with friends too. Yummy! I’ve made this twice. The first time was a few weeks ago with boneless pork ribs, and they turned out great. The second time was for dinner tonight. I used pork loin cutlets in the Crock Pot on low with the sauce, then chopped/shredded them to serve as BBQ pork sandwiches. I made a double batch of the sauce so it could cook with the meat, as well as to spoon over the meat on the sandwiches. That sauce is soooo good! I could eat it with a spoon and skip the meat altogether! Ha ha! 😉 Thanks for sharing your delicious recipe. 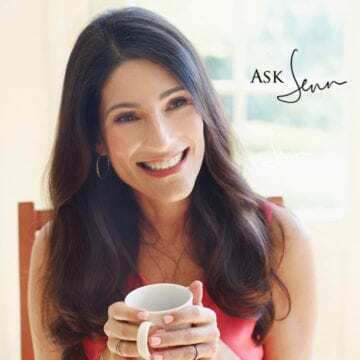 Hi Jennifer, can I use bone short ribs? My kids love to hold the ribs’ bone. Hi Erlina, Yes, you can use bone-in short ribs. The cooking temp will be the same. They might take a bit longer, but not much. Hope you enjoy! Hi Jenn, I made these for my family last night, followed the recipe exactly, and my ribs were very dry. They looked extremely overcooked. Not sure where I went wrong. I used a slightly larger pan, so the ribs were not tightly fit. Could that have something to do with it? I bought high quality ribs, so I don’t think that has anything to do with it. I’ve made SO many recipes from your site….it’s my go to several times a week for dinner ideas. This was the first recipe that didn’t turn out for me. Any advice would be great! Hi Jamie, Sorry to hear the ribs were dry! Yes, I suspect that it was the size of the pan that was the problem. The ribs are supposed to be surrounded (and cooked in) their own juices, so if the pan was too big, that would cause them to dry out. Next time, try using a pan where the ribs just fit. Amazing!!!! I’ve had boneless ribs from a local supermarket that you cook at home and they were good but very expensive £7.50 a box and it only just serves 2. Made this recipe and my husband and friends all loved it. I couldn’t get hold of short rib, so my butcher recommended that I used ribeye steak instead it worked out perfectly and I’m making it again tonight. Fantastic crowd pleaser that’s easy and fuss free!! I made the short ribs and they were excellent! The BBQ sauce was really good, my favorite now. My wife raved about how delicious and tender the ribs were. Easy recipe too, we’ll be having these again soon. This BBQ short rib recipe is the best I’ve found. I’m always looking for the best of the best for any recipe & this is definitely it. I made them a while back for my son & some of his friends and they mysteriously always know when I’m cooking them so I always buy 3 times the ribs I normally do. Is there a substiture for sugar in this recipe? Hi Chris, you can use the equivalent amount of honey here. Hope you enjoy! Yes, that would be fine. I would take it out of the fridge about 45 minutes before you put it in the oven. Just terrific!! Very tender and very easy to prepare! Thanks for another great recipe!!! What temperature should I cook these ribs? You mentioned to preheat oven at 300 degrees. Hi Jenn – just wondering if I am unable to get a hold of beef short ribs whether there are any other good options of beef or meat I could use for this recipe? Hi Jennifer: I read your recipe for oven baked BBQ ribs and it looked so easy that I was certain that it couldn’t be THAT delicious …but, I have tried many of your recipes and they are ALL that delicious ! I was craving some comfort food and gave the short ribs a try last night. They are amazing , so easy , flavorful with melt in your mouth tenderness. They partnered well with noodles tossed with butter and dill. Thanks so much for sharing ! I’ve been searching for the best BBQ sauce and yours is it! Thank you for generously sharing your recipe. Oh, forgot to mention. I used bison instead of beef and they turned out wonderful. I too make this is in a smaller quantity (cooking for only 2) using only 1 pound of meat (yes, Whole Foods meat is the best) and by just dividing the sauce quantity amounts by 4 – but cooking time remains the same. It always comes out tender and delicious. This is now a family favorite. Thank you Jenn! Overall these ribs were outstanding, particularly the BBQ sauce! Another winner from Jenn. My ribs came out a little tough, however. I used high quality ribs, but I wonder if I had to cook them longer? I shortened the cooking time overall because I used 2 lbs instead of 4 lbs of meat and my convection oven tends to cook things faster. They felt tender and looked very brown, so I was afraid they would burn and took them out early. In general, if I use less meat, do you think I should cook them a shorter time? I’d like to start out my mentioning that I’ve made some of your other recipes and they’ve turned out beautifully. Unfortunately this one did not. I made the receipe on two occasions and both times the ribs were tough. It seemed like the fat layers did not melt. Should I have left the ribs in for longer? Not sure what went wrong. But, the BBQ sauce was amazing. Yes, I think it will help if you leave them in a bit longer. They should be really tender when they’re done. Also, make sure you’re getting high quality meat for the best result. Most tender beef ribs ever and the flavor was so delicious. My mom came over the next day and didn’t want to eat them because she thought they were pork ribs, once I told her they were beef, she still couldn’t believe it. She raved about them for days! Saving this recipe. Such easy prep and the whole family LOVES them! Do you think I can place the short ribs on top of uncooked carrots so the fat mixes with the carrots while they are cooking? This looks great and I will be making it soon! Brian, I’ve never tried putting anything under the short ribs, but it sounds tasty :). If you prepare it that way, let me know how the carrots turn out! The carrots were perfect after half the cooking time. Overall I could cook the meat at a slightly lower temperature for a little longer to make the meat even more tender. Thank you! 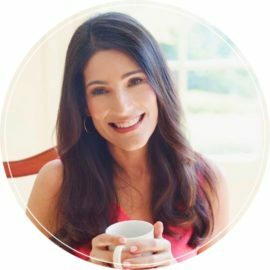 I’ve made at least 1,000 meals using recipes found online (including many from your website-all phenomenal), but this is my first review. In fact it’s my first review of anything ever. To say this recipe was a success is such an understatement. My 2 year old tried them and asked for more. Not knowing her you probably don’t know that this is pretty much the best compliment you could receive. She lives off of Raisin Bran, hummus, and pears and gags at the sight of meat. I don’t know if it was the brown sugar in the barbecue sauce or what, but wow!! I was blown away. Thank you so much!!! I just served these for a party of 10. The butcher at Whole Foods recommended I get 7-8 pounds, given that half of the group were small-eating females. I can’t tell you how many rave reviews I got. Everyone wanted the recipe. And the amount was perfect; I had a few leftover but my husband took care of that problem the next night:) I’m sooooo happy I found this website, Jenn!! I want to make this recipe for about 14 people, so I am planning on have about 14-15lbs of short rib… How long should I cook it for? The cooking time can remain about the same! Hope everyone enjoys! Thank you so much for getting back to me, made this for 14 people, last night. Was absolutely delicious! Made small modifications, cooked slightly longer and added a couple other ingredients to the BBQ sauce.. Other than that this recipe was spot on and everyone enjoyed it! Honestly the best thing I’ve eaten in a while. I uses pork ribs and skipped on the Cayenne Pepper and it was AMAZING!!! What kind of pork ribs did you use? Rachel, They are boneless beef short ribs. Hope you enjoy them! I made these and they are super good! These were the best short ribs I have ever had. I could have doubled the recipe and they would still be gone! This beef ribs were absolutely delicious. My husband loved this recipe. He thought it was better than buying barbecue sauce and applying it on the beef ribs. This recipe is a keeper. My whole.family loved it. Thank you for sharing the recipe. So if i make this the day before, do i just reheat it in the oven or microwave? Hi Christine, I’d reheat in the oven, covered with foil, at 300°F. Ok thank you Jenn. It should taste just the same and not get dry right? This recipe is a winner again and again. We have made double batches and freeze the beef in individual serving sizes. We just add the beef and some of the sauce in a sandwich Ziploc – just take it out the day before to defrost. Thanks for recipes like this! If you wanted to do the first part of the recipe in a slow cooker, how long would you cook them? on low I assume? Hi Louisa, I wish I could be more helpful but I haven’t tried this recipe in a slow cooker. Sorry! Made this exactly as the recipe stated and it was super good. Everyone loved it and wanted more. Will definitely be making this again. I’ve made this with boneless beef ribs several times and my whole family LOVES them. Will it work with boneless pork ribs as well or would I need to make modifications? Hi Mariam, I do think it would work without any modifications; if you try it, please let me know how it turns out. Delish!! Easy (loved just popping them in the pan) and quick to mix the tasty sauce. My kids liked it, too. We don’t normally have ribs, so I’m going to try the sauce on pork tenderloin. Everything I’ve tried from your website has been excellent. These ribs look so delicious. But I could only find bone-in short ribs. Should I adjust the cooking time for these? Hi Dawn, The cook time will be about the same. So glad you’re enjoying all the recipes! I just made your ribs, and they were great. My only change was to bake the ribs on low(250) for 3hours. Spooned off the fat, and finished them on a low with your BBQ sauce for 1 hour. Served then with scalloped potatoes. Thank you. DELISH! This is my kids most requested meal. I have used this sauce on chicken and salmon and it never disappoints. Can you use bottle bbq sauce and spice it up a little? Hi, going to make these tomorrow, only problem is that I have bone in Short Ribs. Please can I ask your advice on cooking time / oven temp? Can’t wait to try your lovely recipe. Hi Nichola, Cook temp will be the same. They might take a bit longer, but not much. Enjoy! Your recipes are outstanding. I feel so fortunate to have stumbled upon your website! Whole Foods in my area said they only carry chuck boneless because they are less fatty, and they precut them. The man said he would order them uncut for me and I can tell them how I would like them cut. Would 8 lbs of this chuck style still serve 8 people, like the cut you use, and how wide/long should they be cut? Same cook time and temp? Thank you! Hi Kelly, Yes, 8 pounds will be more than plenty. I would have him cut them like short ribs (about 2 inches wide x 4 inches long). Cook time and temp would be the same. Please let me know how it turns out. Thank you for the recipe…I have family coming over and I planned to cook bone-in spare ribs but I didn’t like the looks of it, so I purchased boneless beef short ribs instead and was unsure how to cook. Since everyone is expecting charred spare ribs, how do I modify the recipe to bake in the oven and then end with cooking on the grill to get some char? Hi Tanya, You can throw them on the grill at the last minute — just brush them with some of the sauce and cook until charred. Would this recipe work for pork back ribs? Hi Karen, Unfortunately, it won’t. Sorry! Delicious! A firm favorite in our house. Easy to make as well. The recipe looks tasty and I’ll probably try it, but in smaller quantities – I mean, how can you think about putting out a recipe that is 1300 calories per serving? Before you even add potatoes etc? I’ve made these a couple times now and they’ve come out perfect every time! Tender, juicy, just perfect! Definitely have to save the recipe to use over and over again. Hi there! I’ve made these short ribs before and loved them. I’m preparing to make them for my whole family and am going to double the recipe. Should I cook longer than 3 hours at 300? Or would it be about the same. Thanks in advance! Hi Erin, Use two pans; cool time and temp will be about the same. Hope everyone enjoys! These ribs are FABULOUS!!! So easy…so tasty….so 5 stars. You have the BEST website for cooking that I have ever used. Thanks Jenn…. Every recipe I have tried from your website is a winner. Should have doubled the recipe!! WE ALL LOVED IT!! Simple and Delicious! I couldn’t believe how easy these were to prepare. They were so tender and delicious! I will be making these again soon. I want to make ahead and serve while camping. How can I reheat on gas grill? You can reheat over low heat (covered), basting with additional sauce so they don’t dry out. This recipe sounds amazing, however, I have a gas oven and the lowest temperature available is 350F. Do you think it would turn out alright if I just tried to cook it for the same time, or possibly 30 min less at 350F instead? I’m really hoping the 50F difference won’t make the meat tough and chewy. Just made these tonight for the family and we all LOVED them! However, I was wondering if this recipe would work with a less fatty cut of beef and if so, what you might recommend (and how to adjust cooking time)? Many thanks! Hi Allison, Glad you enjoyed the short ribs. Unfortunately, I don’t think it would work with a different cut without changing the recipe entirely. Sorry! Hi I’m cooking this for my parents who don’t like their food spicy. To make the BBQ sauce, should I not add the chili powder and cayenne pepper or reduce the amount of chili powder instead? I absolutely love the recipe the way it is, thank you for sharing! Hi Leis, I would omit the cayenne and cut the chili powder by half — shouldn’t be too spicy at all. Hope they enjoy it! I have a mix of bone-in beef short ribs and pork short ribs I got from the farmer’s market. Would this work on both? Thanks for any info!! Hi Carol, I am not familiar with pork short ribs — do you mean rib tips? Absolutely fantastic !!!!! Cooked as per recipe only added an extra 20 mins. Will make those again for sure, will even try bone in version. Excellent! Thank you for this recipe! I felt like I had served dinner from one of Toronto’s finest restaurants — yet it was so easy. Served with mashed potatoes (of course) and mashed sweet potatoes — luxurious comfort food! 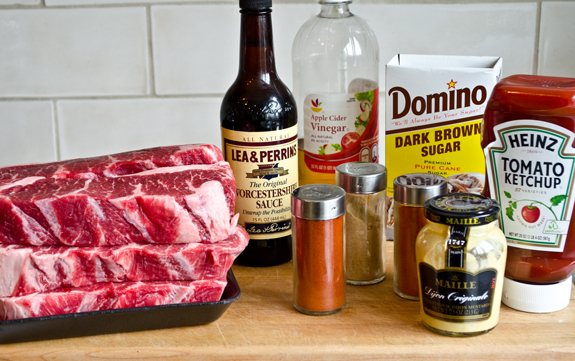 Would it ork to use bone-in short ribs instead of boneless ribs for your bbq short rib recipe? Hi Helga, Yes, that should work. I’ve made your boneless BBQ short ribs a couple of times and both times they were delicious, yet a little tough. I know I need to cook them longer and I’m wondering, am I better off increasing the temperature to 325, or increasing the cook time by 30 minutes (or until tender), and should I have the convection oven on (I did not). We loved them so much. I’m making them again this weekend and I want them to be perfect. Hi Abbie, I would leave the temperature the same and cook them a little longer (without the convection setting). They should be super tender; make sure you’re getting them from a good source. Adding 30 minutes did the trick. They were perfectly tender and everyone loved them. I love your website–you have become my go-to source for recipes. Hi, Jenn. I too loved the flavor of this recipe but ended up with slightly tough meat. I cooked them 50 minutes uncovered instead of 30. Do you think I should have cooked them even longer or were they cooked too long? The meat was not tender after 30 min uncovered. The meat was from Costco. I looked to be good quality and was nicely marbled. Hi Lauren, if short ribs are tough, they likely aren’t done. You mentioned that you cooked them for 50 minutes uncovered. I’m assuming that’s after cooking them covered first, right? Next time, I would try putting them back in the oven for 30 more minutes. I hope this yields better results! Hi Ken, I use plate boneless ribs. Thanks, I was hoping you said that, as the chuck version is not the same quality. Hi Margaret, For the first part, yes — but you’d need to transfer it to the oven to brown at the end so not sure it would make sense. The recipe calls for 4lbs beef short ribs. I am using 2lbs. Should the cooking time be reduced? Hi Linda, The cook time will be about the same. I made these short ribs tonight with smashed potatoes and roasted brussel sprouts. This was my first time ever making short ribs and trying any recipe on this site – they were PERFECTION. So good, Rave reviews. I followed the recipe exactly, except a bit of additional mustard to the sauce and some red pepper for heat. Thanks so much. I’m officially a fan – looking forward to trying other recipes. I had some ribs and it was a very hot day for them to be cooked in the oven, but I know they can be a little greasy for the slow cooker, so I boiled them for about 30 min. to get rid of the grease, then put them in the slow cooker with the sauce. Family loved them and wanted them for the next day, had to hide some of them for the hubby to take to work the next day for his lunch, LOL. Loved, loved the sauce, better than my homemade BBQ sauce, hubby says when we BBQ outside this summer maybe use the same recipe. Since it`s cooked in the oven (or my crockpot) can I still use it for the grill? Thank you for any response. Hi Pauline, I’ve never tried them on the grill, but I suppose it would work if you cooked them very low and slow. You might also try wrapping them in foil for the first few hours before adding the sauce, so that they cook in their own juices. Excellent recipe. Followed directions as shown, very simple. Serving with brown basmati rice, roasted beets and sautéed carrots. Will definitely make again. This is a main course I keep making over and over again as is because my boys love it. It is so easy and flavorful! I loved these ribs! I made them for my sister and her husband and my family, everyone loved it. My kids are 10, 9 and 5 and we had no complaints from the kids either. I made it with the roasted broccoli and mash potatoes and I also made the sweet potato biscuits with honey butter. My sister said ” oh I don’t like honey butter” I said ” oh have you tried it before, how do you know?” so she rolled her eyes and tried it and loved it! Another great menu… Thank you Jenn I love all your recipes! Help!!! The boneless ribs I bought are much thinner than normal. Will the recipe still come out alright? Cannot wait to make these and I have company coming tonight. Will sit by my computer! Hi Diane, I think they will be just fine. They may fall apart a bit but that won’t change the taste 🙂 Also, you may not need to cook them quite as long; just keep an eye on them. I loved how tender the ribs turned out–perfect cooking strategy. In all honesty, I think that the sauce is good, but perhaps not worth all the trouble to make it. Next time, I am going to use my favorite bottled BBQ sauce. Love these short ribs. Any substitute for dijon mustard if someone is allergic to mustard? This will make the meat and potato lovers beyond happy. The flavor is wonderful and the meat is fork tender. The big bonus, so easy to prepare. Perfect comfort food. Thanks for another wonderful recipe!! When I served this dish to my family, I didn’t need to put out knives…the ribs were tender and wonderful. I served it with a creamy butternut squash polenta and roasted broccolini. Instead of the foil covered baking dish I used my Le Creuset Dutch Oven and it worked just as well. We are trying to make sure to always have short ribs in the freezer so on lazy afternoons we can throw this in the oven. This is a blue ribbon winner with my family! The short ribs are so tender and flavorful – sheer perfection. This recipe is one of the best I have ever made. Something this simple should not taste this good, but it is incredible and I have been craving it for the two weeks since I made it. Definitely going into the regular rotation. I wouldn’t change a thing. Thanks! I cooked this recipe exactly as stated and the short ribs came out tough! The sauce was excellent though!! I would love to try this again….maybe the 300 degrees was too hot in my oven? Should I try it again at 275 degrees…same amount of time? Hi Betty, You may actually just need to cook them longer. I’d put them back in the oven for 30 minutes and see if they get tender. 2.5 hours is definitely not enough time for this volume of meat. Regardless of quality. 4 hours minimum before you start checking for tenderness. The recipe is good. It’s a pretty basic concoction on bbq sauce. Another outstanding receipe. Thank you so much. 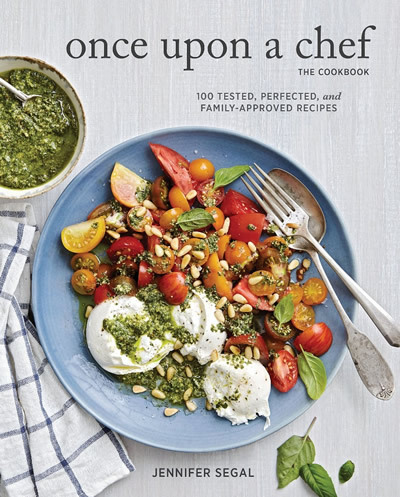 Do you have a book with all your recipes that we can buy or get. Wow- this recipe is delicious and so easy!! This looks so good! Can I ask a silly question? Why did you choose a boneless short rib instead of leaving the bone in? Is there a difference? Super yummmm!!!! Happy happy !!! Came across this recipe just today and made them for dinner tonight. Absolutely delicious! The entire family enjoyed them as did I. Initially, I was afraid to smother all that barbeque sauce on the meat so I used very little during the cooking process (I am considered the picky eater of the family). It did not take very long before I decided I needed to smother all the ribs in this sauce and I am glad I did. I definitely will make these again as everyone is already asking when will be having these again. Thank you for sharing this recipe. I made these last night for my in-laws and everyone raves about them. So easy to make and really delicious. The texture and flavor of the meat was outstanding! Definitely adding this to my favorite dinner recipes! My wife made the ribs this time she followed the recipie to the t. It -was almost as good as when I made it using my own imagination and your great recipie a guide. Thank you. I recommend anyone that loves ribs try this very simple dish it’s to die for relish. I would love to make these in a crock pot ( slow baked short ribs) ….how would you recommend i do that? THANK YOU!!!! I am obsessed with your website!!! Love everything i have ever made! Eating one of them tonight! Hi Courtney, Thanks for the feedback — I’m so happy you’re enjoying the site! For this recipe, I really think it is best made in the oven because you need to be able to brown the meat at the end, otherwise it will look very unappetizing. You could make them up to that point in the slow cooker, then transfer them to the oven to brown but not sure if it’s worth the trouble. Absolutely fantastic would be proud to serve these to guests. This is definitely a very simple dish to make, and easy to throw together since there’s no chopping involved. Sometimes the ribs feel a little greasy, but I guess that depends on the fat content of the beef (I get mine at Whole Foods). I usually just steam some broccoli or stir fry some string beans as the side vegetable dish. Very fulfilling meal! I have made this dish twice and it has come out perfect each time. I use boneless beef ribs cut from a chuck eye. I have even used the bbq sauce on other dishes and what an amazing taste it adds. This is worth the time. Easy to do, but it takes time. I will do this again. Can this be made with bone in short ribs? Is so, would the recipe remain the same? I will for sure. Thank you for your quick response. Fyi your website is my total “go to” since a friend turned me on to it. I have made many of your recipes over and over. And have recommended your site to anyone who cooks or bakes. My ribs are bone-in – would i cook the same way & could i use a Dutch oven? THANKS! Hi Sheila, Yes and yes, although you may need to cook a bit longer. Hello, looking forward to trying this recipe. I only have the short ribs that are cut into thin slices. Would the recipie still work? Hi Carrie, I think it would work, but it probably won’t take as long to cook; just keep an eye on it. Absolutely LOVED this recipe! I loved reading the bio as well! Have a lot in common with France and working in the industry currently! Tiring for sure! Thanks for sharing these flavors with the world!!! I couldn’t find boneless beef short ribs, so I bought pork shoulder country style boneless ribs. Will those work as well and how do I adjust the instructions/cooking time? Thanks! Hi Betsy, Yes, pork country style ribs should work fine. Cooking time should be about the same, but taste to be sure they are getting tender after 2.5 hours before you remove the cover. If not, cook another 30 minutes and check again. Hi Lisa, I’d put them in a small pan and cook them at the same temperature. The cooking time should be about the same but I’d start checking them after two hours to be sure. Awesome, awesome, awesome!!! We loved this recipe! I tried one slight tweak….I seared the ribs very quickly over high heat on my gas grill (with applewood chips in the smoker box)…no more than 2 minutes per side. I don’t know how much that changed the flavor or the texture but they were awesome! Thank you…. Fantastic, making them 2nd time in Aug.
We have food allergies, and this recipe was a hit, we used gf spices, etc. Simple, great directions, like the tip of pouring out liquid, to brown. Just made these short ribs last night along with the thyme carrots recommended – out of this world good! I’d never made either before but we’ll definitely be making them again. The fragrant aroma was tantalizing and filled the whole house! I can’t get no satisfaction in the kitchen. But I try, and I try. I have 2.5 lbs. of boneless short ribs. I can see the recipe is easy enough, but please clarify the final 30 minutes after removing the cooking fluid. Do I keep the foil or do I bake uncovered? Bake uncovered for the final 30 minutes so the ribs brown. Enjoy! Not my favorite. Made a small batch. Stopped at two hours, since I was making less. Still, the short ribs were tough and rubbery. I’ve made a lot of ribs, and other recipes worked better. Also, wherever the foil touched the ribs, the vinegar ate through the tinfoil. Not nice to have to pick out bits of melted tinfoil from the ribs! Hi Gabe, Sorry you didn’t enjoy the short ribs. Even though you cooked a small batch, they needed to cook longer — if short ribs are tough, they likely aren’t done. Not sure what happened with your foil; I have never heard of that happening. Where is the recipe for the potatoes and carrots shown in picture? Hi Nikole, I don’t have those exact recipes on my site but check out my Roasted Carrots with Thyme and Parmesan Smashed Potatoes. Awesome, thanks, making them again today. I made this today,followed the precise recipe . The ribs were moist,and juicy and sauce was excellent. I am not a good cook,but thanks to your recipe I was today. My first time making short ribs. The house is smelling wonderful. The recipe was on point and my ribs are too. Will definitely use this site more often. My beef short ribs came out amazing!!! I followed the recipe to a T and it came out perfect. Thank you so much for all your fabulous recipes! I also made your Thai Curried Chicken skewers with Peanut Sauce and I’m making the Simple Summer Strawberry Cake for the 4th of July holiday. I’ll be back again and again. Can I use other cuts of meat for this recipe other than boneless short rib? This recipe looks amazing! The thing is i have boneless short ribs but they are cut way smaller and thinner. What do u suggest I do to as far as cooking time and temperature? Hi Desiree, The temperature would be the same but they may not need as much time in the oven; I’d start checking after 2 hours. Add a generous splash of red wine to make a more grown-up flavor. Hi Steve, You can absolutely make these in big batches. You might have to increase the cooking time a bit; just cook until tender. Hope you enjoy and please let me know how it comes out! Hi Jenn, I did make these in several batches of the size called for in the recipe, and just prepared and baked all four pans at the same time. Didn’t even increase the cooking time by much, and they came out great. Everyone raved over them. Thanks for a great recipe that’s about as easy as it gets. A real keeper. These scrumptious ribs melt in your mouth. We’ll have to make twice as much next time. They were gone in no time! I have some st.louis ribs that I need to cook soon. How should I adjust this recipe since they are not boneless? Hi Kim, I actually think the cooking time would be about the same. Please let me know how they come out! This was one of my favorite dishes to make—it is easy to make and AMAZING! The bbq sauce is wonderful. My boyfriend and I were licking our plates!!! I will be adding this to my recipe box for sure. I can’t wait to have a dinner party—it is sure to please everyone! I bought some short ribs & have never made any before. I was looking online for a recipe & found this one, i decided to make it because it was sooo easy to prepare. I used regular mustard because i didn’t have any dijon, and my hubby loves sweet stuff so i made it a little sweeter. I gotta say this is one of my favorite. My husband absolutely loved it, he said “my mouth is really happy right now”…lol. Thank you for sharing this delicious dish!!!! Loved this! Loved it even more when my very picky eaters both ate their serving and then asked for more. Looking forward to finding more yummy delights on your pages. Thanks! If I am only cooking 1 pound of boneless short ribs should I adjust the cooking time / temp? Hi Gary, I’d put them in a small pan and cook them at the same temp. You might check on them a bit earlier but cooking time should be about the same. I’m committed to trying this recipe, but I’m curious, why don’t you brown the ribs first, instead of “exposing” them prior to the end of the cooking time and browning them at that point? Also, do you use “flanken” style ribs for this recipe or the ones that look like “blocks”? Hi Alan, Great question. I usually do brown my stew meats before they go in the oven but it’s not always necessary. I tested this recipe both ways and found that browning the short ribs did nothing to improve the flavor — in fact, I actually preferred the taste of the ribs that were not browned. The main reason I expose them to the heat at the end is to make them look nicer…and it’s a whole lot easier than searing the meat beforehand. I use the ribs that look like blocks. Hope you enjoy! I made these last night. They were AMAZING. I sent a picture to my mom and she was almost ready to jump in the car and risk driving in the 12+ inches of snow. I promised to put some aside for her and she can have after the roads clear. This recipe is a keeper. Made the exact dinner you had in the photograph and my husband was thrilled. He loved the entire dinner. I loved the more subtle flavor of the BBQ sauce in the recipe – for the short ribs it was much better than any stronger flavored store bought variety. This would make a great dinner for company as you could do all the prep and most of the cooking ahead of time. OMG!!! Made these for dinner tonite with the thyme carrots and lightly smashed potatoes!!! Deeeeeelish!!! And so easy!! I will make these again when having friends over! Thanks Jenn for continuing to supply AMAZING recipes!!!! These look so good. I love things I can just put in the oven or a Dutch oven for several hours. I can’t wait to try this recipe. We like country ribs, do you think they’de come out about the same? Hi Kim, Yes they will be very similar. These sound amazing! Making them for dinner tomorrow … With those yummy carrots! You are the best Jenn!!! This sounds wonderful! Could you make it in a crock pot and if so, what modifications do you think you’d have to make? (My oven is out of commission.) Thanks! Yum! I think I’ll be making these on Sunday. Can you share your carrot recipe also? They look delicious too! Can I make this with pork chops? If yes, should I change recipe in any way. Hi Vera, Pork chops are a tender, quick-cooking cut so they will not work in this recipe. Sorry! these sound delish – I can’t wait to try. My mom makes a great rum rib – I wonder if you could add rum to this recipe for some additional flavouring? Pretty much any BBQ sauce would work with this recipe, so feel free to add a bit of rum if you like.